I remember the night very well. We had 4 tickets to a Jazz game and had invited my sister and her husband to go. Problem? Babysistter. We had 6 children at the time. Do you know how much you have to pay babysitters? I didn't for a long time. We just didn't go anywhere. When I asked, I was told $1/hour per child. PER CHILD?!?!?!? That's six bucks an hour, more than minimum wage at the time! No wonder we never went anywhere. We decided that it was time to see if our older kids could handle babysitting for longer than half an hour. If you look at an official astrological chart, I'm a libra. I was thinking, that there are things other than the stars that might influence what you're like. For example, if you're born in October, perhaps you enjoy dressing up or eating chocolate. February, you're loving and like chocolates. April, you have a penchant for bunnies and chocolate. (I could probably work chocolate into every month.) For me, being born in September doesn't seem to be a coincidence. Yes, I like autumn and the start of school (tho' that didn't happen till I had kids), but the real reason September is such a great month is---- the new fall season on TV. We're all thinking the same thing today, aren't we? It's kind of sad to say that the events of 9/11 don't cross my mind very often. 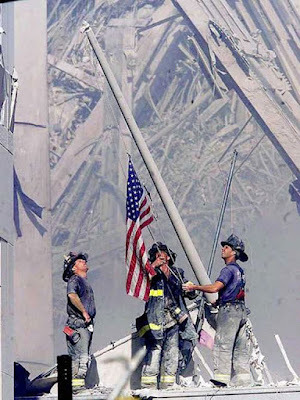 We say, "We'll never forget. ", but in the day to day of our lives, we do. Forget. I didn't know anyone who died that day. I live 2000 miles away. It's hard to keep something in mind when it's so distant. The same thing can be said of our spirituality. How many times do the scriptures talk about 'remembering'? Because, in our everyday lives, with kids and jobs, housework and mortgages, we tend to lose focus. Our Heavenly Father, knowing our nature, gave us helps for our memory lapse. The gospel is filled with symbols that are given to help us recall what's really important. I don't like confrontation. I avoid it any time I can. I don't argue and hate debates. I'm not a 'political' person either. Aside from voting in elections, I don't get involved. I never wanted this blog to be controversial or to offend anyone. Because of this, I have some trepidation about this subject. But, this is my blog and I'm determined to be honest about my feelings. This week, I've had some very strong feelings, so here goes. Next week, our president is going to talk to the students in our country. There are a lot of people who are against (and even angry about) this. I'm so confused by this attitude. I didn't vote for President Obama and I don't agree with much of what he says or does. That said, he is the leader of our country. He earned that honor not by force or coercion. He was voted in by the majority. Whether we like him or not, he deserves our respect and our loyalty. I was listening toKathy Lee Gifford on TV the other day. Listening, because I was on Facebook and too lazy to get up and find the remote. So, I hear her talking about the fascination with Twitter and Facebook. She said she didn't get it, that she felt everyone who did that was a narcissist. Really? This coming from a woman who sits on TV for an hour everyday and talks about what else? Herself. Hmmm. It's human nataure, I think. We all want attention, we want to know someone else cares enough to be interested in what we're doing, thinking, saying. Why in the world do you think blogs are so popular? But, really, it's all about your perspective. If you twist it the right way, everything we do could be considered self-centered.